Available Now in Print and on E-Readers. After the success of her first book, "Rescue: Pursuit of the Ultimate Dream", Sue van Schreven once again will delight readers with the continuing story and insights into her work to bring relief to some of the world’s poorest. Sue and her family have travelled extensively and along with loyal supporters and partners have seen transformation in individuals, families and communities. This is a story of hope — and it’s both refreshing and real. Rescue2: The Dream Unfolds. By Sue van Schreven. RRP NZ $24.99. ISBN: 978-0-473-41850-2. 124 Pages. Stirred with a passion to help others? Join Sue as she shares insights into one of New Zealand’s fastest-growing charities, Orphans Aid International. Learn from experience and avoid some pitfalls as you pursue your own personal dream. This book is a must-read to encourage you in your own goals. Recommended for those with a desire to serve across our globe with helpful tips for those in the charitable sector. A must-have for budding humanitarians! 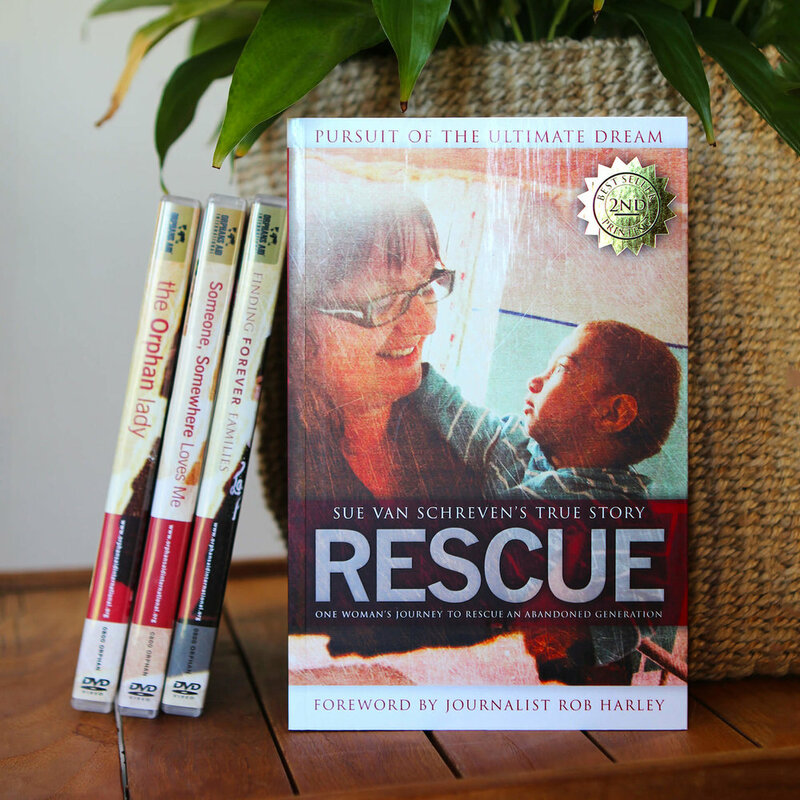 Rescue: Pursuit of the Ultimate Dream, by Sue van Schreven. RRP NZ $29.99, ISBN: 978-0-473-18976-1. 180 Pages including 24 Full Colour Pages. Founder and CEO of Orphans Aid International, Sue van Schreven is the wife of Carl and mother of two teenage boys, Ben and Daniel, an author and sought-after speaker. Sue and Carl are based with their sons in Queenstown, New Zealand. Together they established Orphans Aid International as a registered charitable trust in 2004. The trust is now working in six nations including New Zealand and has been responsible for the care of thousands of children. This is Sue’s second book. Her first book, “Rescue: Pursuit of the Ultimate Dream” was released in 2011 and is now in its third printing. Sue and Carl and their growing team have been the feature of three TVNZ documentaries, and her story has been screened numerous times across various TV channels including Air New Zealand long-haul flights. She has also been the recipient of several Vodafone Foundation awards and more recently in 2016 was a finalist for the New Zealand Women of Influence awards. Sue describes herself as enjoying the simple things in life; her family, friends, walking the dog and taking time to write. She believes her extensive travel, especially to third world countries, has helped shape her desire to prioritise what is important and to keep others who are less fortunate in her focus. Prior to her humanitarian work, Sue was for many years a Youth Pastor for several churches before becoming an accredited financial consultant. Sue shares from her own first-hand experience starting a New Zealand charity from scratch and piloting it through to a successful and fast-growing organisation. She has navigated a changing landscape while raising a growing family, and here, in her second book, “Rescue2: The Dream Unfolds”, seeks to share some of her insights for success with her readers. © Copyright Susan van Schreven. All rights reserved. This is my personal website—some of my thoughts on paper (or a screen perhaps). The opinions I express here do not necessarily represent those of Orphans Aid International Charitable Trust. The information I provide is on an as-is basis. I make no representations as to accuracy, completeness, currentness, suitability, or validity of any information on this website and will not be liable for any errors, omissions, or delays in this information or any losses, injuries, or damages arising from its use.